Deep Democracy in Action - Ayako “Aya” Fujisaki Ph.D.
Have you ever gotten tired of dealing with divisions in a group? Have you ever felt that conflict in a group inhibited collaboration efforts? Have you ever felt hopeless about getting a group to work together on its goals? Learn the philosophy of Deep Democracy and cultivate its attitude. Develop a new type of awareness that views changes and solutions as inherent within a given group. Learn some of the basic skills of Process Work group facilitation. Learn how to apply these new attitudes and skills to their work and everyday situations. The seminar includes both intellectual and experiential learning. So in addition to presentations and discussion, there will be experiential exercises designed for individuals, small groups, and the whole group. There will be an opportunity for participants to present case studies and discuss how deep democracy attitudes and skills can be applied. This seminar is suitable for anyone who wishes to improve their facilitation skills in their personal and professional lives. Prior knowledge of Process Work or group facilitation is a plus, however it is not required to attend this workshop. Group facilitators and change agents tend to feel that it’s their responsibility to create change in a group setting and to find a solution for whatever problem is at hand. This feeling of responsibility can create a tremendous pressure and in some cases can even lead to burnout in the facilitator. Process Work, a cutting-edge approach to group facilitation, offers an alternative by suggesting that change and solutions are inherent within the group itself, and that the facilitator’s job is ﻿not making﻿ change occur but noticing and forwarding the change that is already emerging. This awareness-based approach ultimately doesn’t require power or struggle from the facilitator. At the foundation of Process Work group facilitation is a concept and a feeling attitude called deep democracy, which is the perspective that all aspects of ourselves and all perspectives in a group are equally important and they are all needed in order to co-create sustainable solutions. A Process Work facilitator therefore values facts and conscious goals, but also brings attention to background dreams and feelings, because these subtler aspects often hold a important key to the solution. Yet raising such awareness is not always easy, because we are all trained to notice particular phenomena and ignore others. We literally need to retrain our awareness to develop the ability to “sniff out” changes and solutions as they emerge organically from the group. This seminar offers participants an opportunity to learn about the philosophy of deep democracy and to learn highly practical and applicable skills based on deep democracy theories. In a community atmosphere, participants will practice this new awareness and skill set. 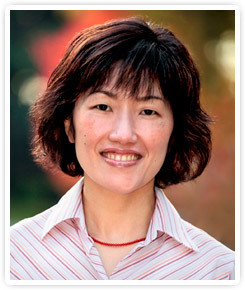 Ayako “Aya” Fujisaki, Ph.D. is a counselor and consultant in private practice in Portland, OR, USA. She teaches Process Work at the Process Work Institute and at a local university, and she leads seminars and educational trainings in psychology, leadership, communication skills, group facilitation, and spirituality both nationally and internationally. Aya is one of the original members of the Process Work training programs in Japan and Russia. Having trained both in Japan and the US and having lived in different parts of the world (including Germany), Aya has gained multifaceted perspectives on individual and group processes and offers a unique approach that shines a new light on clients’ issues. One of her current interests is applying Process Work to international humanitarian and development activities, and she has been involved in projects with local NGOs in Bangladesh and Nepal. Assisting instructors: Sine Andersen, Jenni Schön, Nadine Portillo. Directions: By car via Grindelallee. If your coming from Dammtor turn right into Rutschbahn – it's the only way. Please don't drive into the backyard with your car! No designated parking available. Fee includes coffee, tea and water during the seminar - meals and accommodation are not included. Cancellation policy: Cancellation before Nov 1st is free, after that 50% of the fee is due - after Dec 1st: 100% of the fee is due. If you want to attend the workshop but cannot afford the minimum fee, please contact us directly via deepdemocracyinaction@gmail.com. After registration we'll send you an invoice via PayPal - you can pay that invoice using your credit card or PayPal account. If you don't have either one of them please contact us via deepdemocracyinaction@gmail.com.